I think I’ve mentioned this before, but David and I are great fans of the National Trust and go to their houses and gardens whenever we have the chance. Before we lived here, we’ve been on holidays in Devon/Cornwall and in Yorkshire and darted from one National Trust property to the next. Today we visited two properties, Clandon Park and Hatchlands Park. Clandon Park was OK with an incredible collection of Meissen, Wedgwood and Sèvres (which I prefer) porcelain, but I much preferred Hatchlands Park, which also holds great promise as a prime picnic site. There were pictures there by Tizian!!! Hatchlands Park also had the world’s largest collection of pianos connected to famous composers. I was quite awed to stand in front of a piano, which had been graced (=played on) by Chopin himself. We had a nice traditional lunch at Clandon and then cream tea (just as traditional) at Hatchlands. After that we had to go for a little walk and also found time to take a few pictures. Lovely day out! Photos: Dane and me in front of Hatchlands Park House taken by David. Sèvres porcelain bowl from the Sèvres museum site. Chopin’s piano from Cobbe Collection’s website. My picture of clover from the field ind front of Hatchlands Park House. Last night I went to a concert, which hasn’t really taken place yet. It’s on July the 1st. No magic was involved, but good fortune maybe. We have the luck to be almost-neighbours to Russian concert pianist Irina Lankova and when I expressed my regret that we couldn’t come to her concert at Wigmore Hall in London on July 1st, she invited me to a private concert in her house. 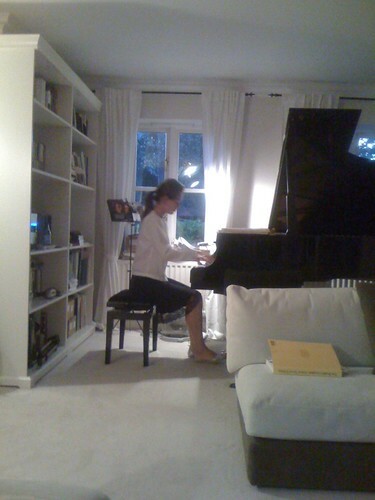 And it really was very private: She played – and I listened. We were the only people there. It was all acted out as a real concert. Irina wore pretty clothes and played through the entire repertoire with only the natural pauses and only talk in the interval. I can’t even begin to describe what an extraordinary experience that was! Her repertoire for the recital is quite masculine if you can put it that way, Rachmaninov, Scriabin and Chopin. On her website you can listen to some soundbites from her CDs. Try the Chopin CD, the last track, Presto, non tanto. Or on the Scriabin CD, the Fantasia, Opus 28, an absolutely amazing piece that I’d never even heard of before. Or my favourite of the evening: Rachmaninov: Prelude, Opus 23, No. 5. If I should describe how her playing sounds to me, I’d say gentle yet authoritative. And quite without hesitation! I’m deeply grateful to Irina for sharing this with me! Top picture snatched from Irina’s website, bottom picture taken with my Iphone last night. Udgivet i juni 20, 2008 Kategorier England, musicTags England, piano1 kommentar til A unique experience!